Cape Ose (大瀬崎) is one of the cape located on the north Izu peninsula. It is the great spot to see Mt. 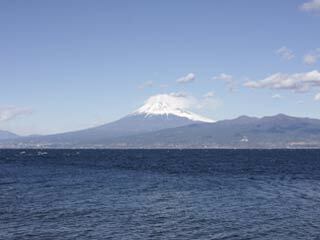 Fuji and Suruga Bay at the same time. The record said, this cape was formed at 684 after the big earthquake. Because the quality of the water is great and the wave is always small, it is very famous for scuba diving. Also at the summer, many people visit here for enjoy swimming. There is a parking and restaurants. Osezaki is small cape which has only about 1km long. At the end side of the cape there is small forest of Juniperus chinensis and a small pond. This pond is solid water pond even located right next to the sea. It is called Kami ike, the pond of god. It is still the mystery why this pond is solid water even it is located right next to the sea. Therefore, it is considered as the one of the seven wonders of Izu Peninsula.